The experts at Kuhn Construction specialize in additions of all types, including complete second floors. We will work with you to create the ideal design for your home and provide you with a quality construction that gives you the home of your dreams. Beginning with a complimentary in-home consultation, our designers can develop a comprehensive plan to create the type of home addition you desire while seamlessly blending it with the rest of your property. If you want to expand your home, call us today at 1-844-801-2652 or click below to get started. We offer free estimates on all our work in Brookhaven, Islip, Smithtown and throughout the nearby areas. Second floors: Adding a second floor is among the most popular choices. This obviously doubles the living area and often provides growing families with the additional bedrooms and bathrooms they need. Don't let a lack of space make your home uncomfortable. The remodeling experts at Kuhn Construction can provide you with a beautiful new addition that will give you the space you need and the function you want from your home. We are proud to be a design/build firm with all the skills needed to bring your project from conceptualization through completion. If a home addition sounds like the right solution for your needs, call us today to get a free estimate. 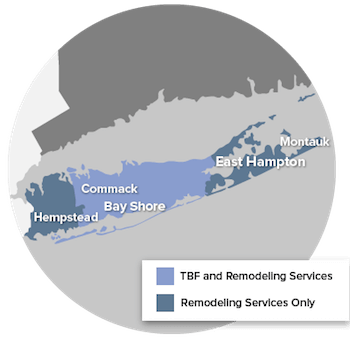 We provide all our quality remodeling services in Islip, Brookhaven, Smithtown, Babylon, Huntington Station, Farmingville, Riverhead, Brentwood, West Babylon, Bay Shore and throughout the surrounding areas.